Between Easton and Hillsboro, there is no Tuckahoe. On the 100th anniversary of the death of Frederick Douglass, Ebony magazine urged its readers to plan family vacations so that the kids could see monuments to black history. They recommended you visit the birthplace of Frederick Douglass. Because you can’t get to Douglass’ birthplace by following the tourist guidebooks and roadside history markers. They point you to the bridge that carries MD Route 328 across Tuckahoe River. The bridge was rebuilt in 2013 and named in honor of Douglass. A historic marker at the end of the bridge commemorates Douglass and his birthplace. But the historic marker is 6 miles off. Satellite imagery and 1875 map of Caroline County, Md., were used to locate the site of an African-American church near an upper crossing of the Choptank River. I recently digitized a paper copy of the map of Caroline County, Maryland, which was drawn by John B. Isler in 1875. 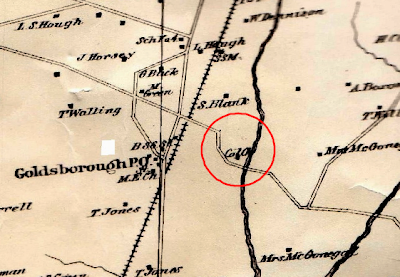 While geo-rectifying sections of the map (stretching and warping the images to match the “ground truth”), I noticed a building marked “Col Ch” on the road east from Goldsboro, at the crossing of a branch of the upper Choptank River. Choptank River Heritage is a coalition of volunteers working to preserve, interpret, and promote the natural and cultural heritage of the Choptank River and its tributaries. We work with partners in local, state, and federal government, and with other non-profit organizations to attract visitors to the Choptank River and encourage participation in river conservation and sustainable economic development.